For the past few weeks, subway-riding New Yorkers have been surrounded by advertisements for absorbent underwear, the latest in a long history of products designed for use during menstruation. 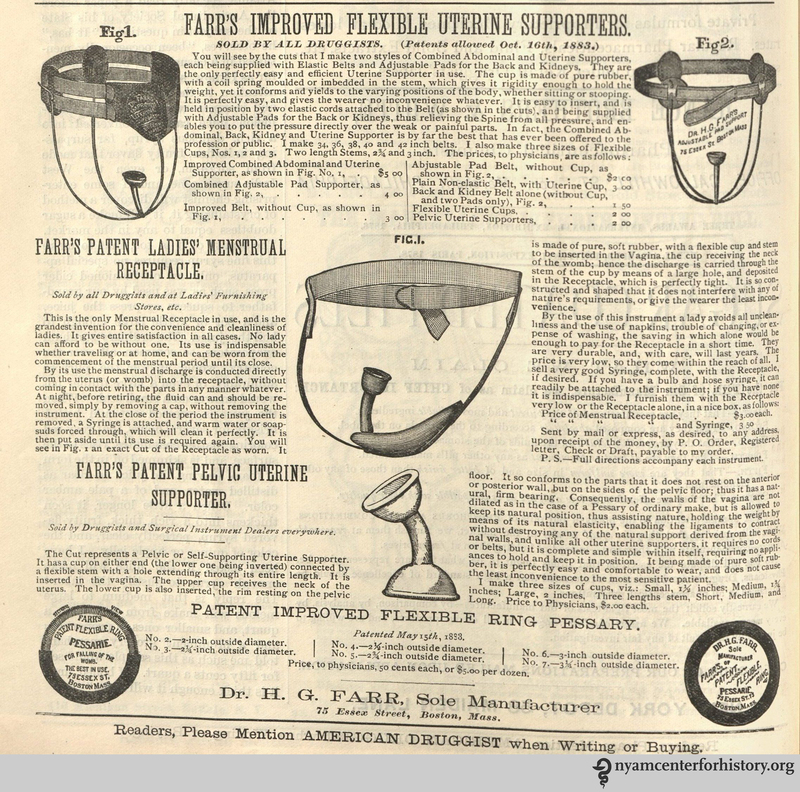 “Farr’s Patent Ladies’ Menstrual Receptacle,” advertised in American Druggist, January 1884. Click to enlarge. There’s a reason these never caught on. But they aren’t such a far cry from today’s (much less cumbersome) menstrual cups. Below are two early advertisements for Kotex, which appeared in Hygeia in 1924 and are both geared to nurses. We love that the coupon from the September 1924 ad has been clipped and, presumably, mailed in for a free sample. 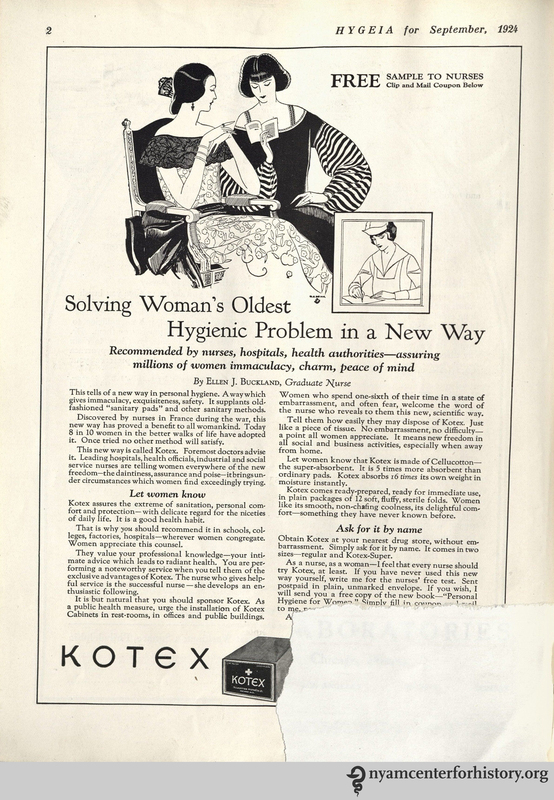 Kotex ad in Hygeia Magazine, September 1924. Click to enlarge. 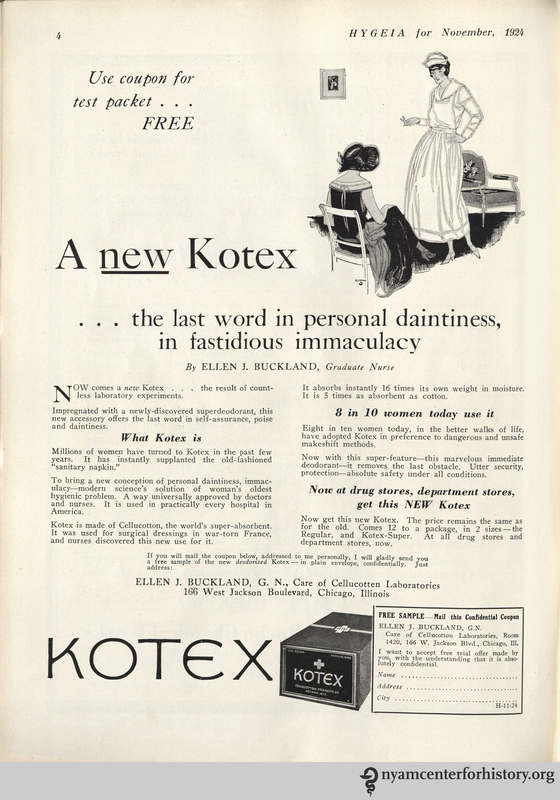 Kotex ad in Hygeia Magazine, November 1924. Click to enlarge. While Hygeia does not appear to have run ads for Kotex prior to 1924, it did advertise an absorbent cotton on the back cover of its volumes in 1923. Bauer & Black Absorbent Cotton touted its many uses in these advertisements, noting that “Women use it to meet personal emergencies.” Even after the advent of commercially available sanitary napkins, some women preferred a more do-it-yourself approach. 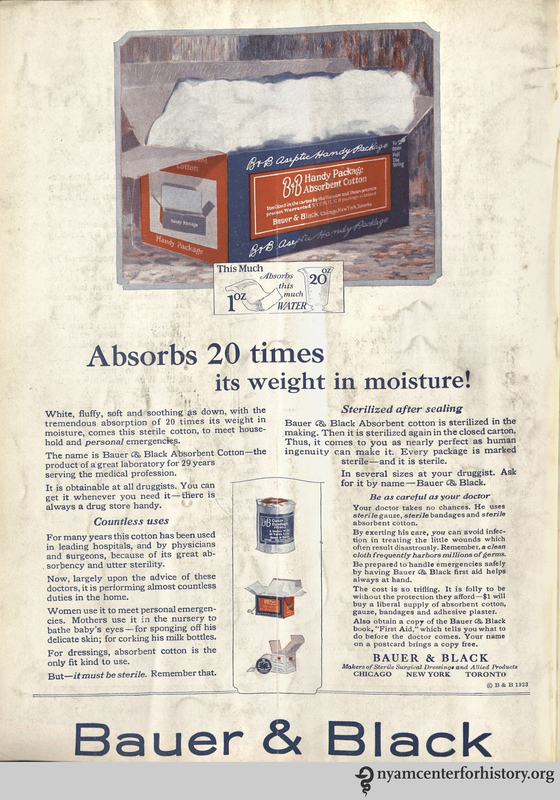 Bauer & Black Absorbent Cotton ad in Hygeia Magazine, August 1923. Click to enlarge. Kotex wasn’t alone in the marketplace for long: Gauzets and other, often cheaper, brands came along soon after, and also advertised heavily. 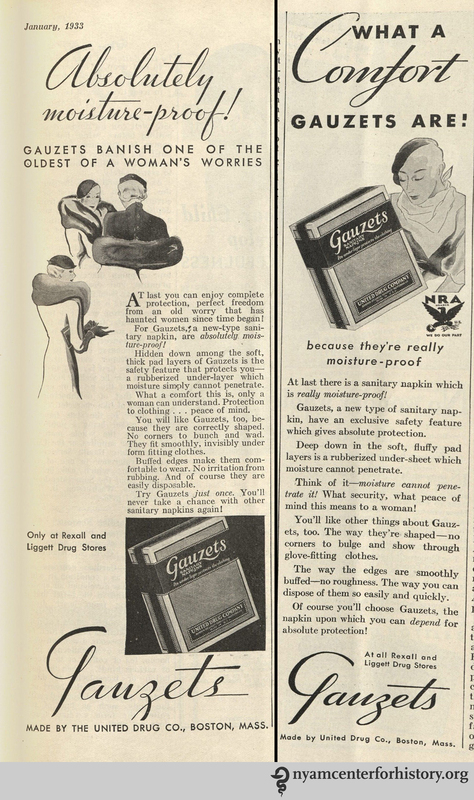 Gauzets ads from Hygeia Magazine, published in January and November 1933. Click to enlarge. The first widespread commercial tampon arrived in the 1930s: Physician Earle Cleveland Haas received a patent for his applicator tampon in 1933, which he named Tampax. He distributed his product beginning in 1936.2,3 Prior to Tampax, tampons had widespread use as medical devices dating as far back as the 18th century.2,3 Soon after the development of Tampax, other commercial tampon brands, like Wix and B-ettes, became available and also advertised widely. These early ads show the hurdles Tampax had to overcome to win wide acceptance from consumers and doctors. In fact, Tampax spent $100,000 on advertising in its first nine months alone; by 1941, the company was “one of the one hundred largest advertisers in the United States.”2 The ads worked: a 1944 survey showed that one quarter of women in the United States used tampons, even as doctors debated their safety.2,3 These ads, spanning the first 10 years of commercial tampon availability, emphasize the safety, comfort, convenience, and invisibility of the products. Tampax ad in the Journal of the American Medical, volume 106, number 1, January 4, 1936. Click to enlarge. Association, vol. 106, number 15, April 11, 1936. Click to enlarge. Wix ad in the Journal of the American Medical Association, vol. 106, number 12, March 21, 1936. Click to enlarge. B-ettes ad in Hygeia Magazine, November 1938. Click to enlarge. Tampax ad in Hygeia Magazine, July 1943. Click to enlarge. Tampax ad in Hygeia Magazine, November 1943. Click to enlarge. Tampax as in the American Journal of Obstetrics and Gynecology, volume 48, number 6, December 1944. Click to enlarge. Tampax ad in Hygeia Magazine, March 1946. Click to enlarge. Tampax ad in Hygeia Magazine, September 1946. Click to enlarge. Other options entered the marketplace in the 1930s: several menstrual cups received patents, including the first commercially available cup in the United States, patented by actress Leona Chalmers as a “catamenial appliance” in 1937.6 This cup’s design looks much the same as those on the market today. In less than 100 years, menstrual supplies have moved from mostly homemade affairs to mass-market items available in stores, from products hidden away at the back of mail-order catalogs to some of the most commonly advertised goods in the United States. The advances of the 1920s and 1930s still impact our lives, as sanitary napkins, tampons, and cups remain go-to products, improved upon over time but not abandoned. 1.Kidd LK. 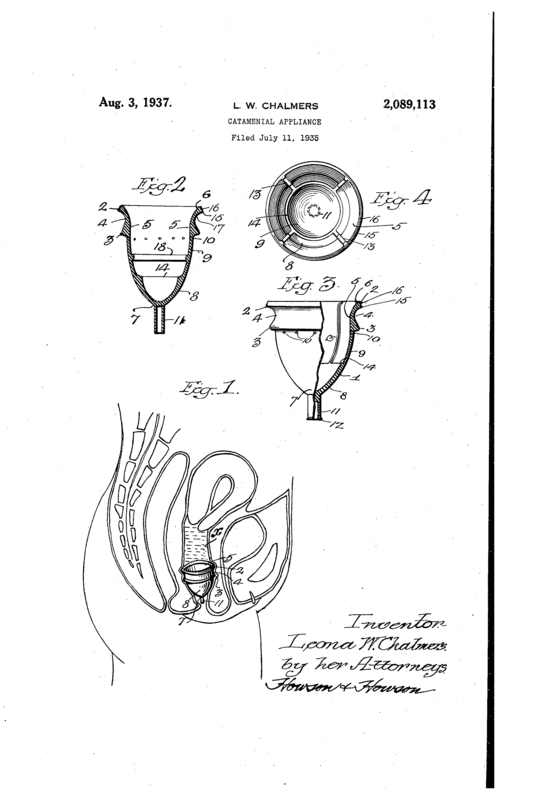 Menstrual technology in the United States, 1854 to 1921. Ames, Iowa: Iowa State University Department of Textiles and Clothing; 1994. 2. Freidenfelds L. The modern period: Menstruation in twentieth-century America. Baltimore: Johns Hopkins University Press; 2009. 3. Fetters A. The tampon: A history. The Atlantic. June 1, 2015. Available at: http://www.theatlantic.com/health/archive/2015/06/history-of-the-tampon/394334/. Accessed March 1, 2016. 4. World War I centenary: Sanitary products. Available at: http://online.wsj.com/ww1/sanitary-products. Accessed March 1, 2016. 5. Vostral SL. Rely and Toxic Shock Syndrome: a technological health crisis. Yale J Biol Med. 2011;84(4):447–59. Available at: http://www.pubmedcentral.nih.gov/articlerender.fcgi?artid=3238331&tool=pmcentrez&rendertype=abstract. Accessed March 1, 2016. 6. North BB, Oldham MJ. Preclinical, clinical, and over-the-counter postmarketing experience with a new vaginal cup: menstrual collection. J Womens Health (Larchmt). 2011;20(2):303–11. doi:10.1089/jwh.2009.1929. This entry was posted in Collections, History of medicine and tagged 20th-century medicine, ads, advertisements, Hygeia Magazine, Kotex, menstrual cups, menstruation, period, sanitary napkins, Tampax, tampons, women's health by nyamhistorymed. Bookmark the permalink.